Ordinary number signatures Boonchoo-Sanoh UNC about 175 - 185 baht. Ordinary number signatures Kriangsak-Nukool UNC about 180 - 190 baht. Ordinary number Sommai-Nukool UNC about 2,300 baht. 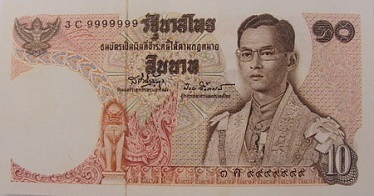 This 10 baht banknote was issued on June 24th, 1969. 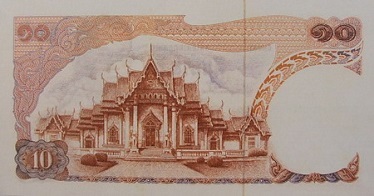 The main color of the banknote is brown. The main object is the image of King Rama 9 in full regalia. The main object is the image of the marble temple.